These numbers should be illuminated. Argh! Devastation. Loneliness. Despair. These, my loyal readers, are my only friends today. Perhaps that's an over-reaction. OK. You got me. Over-reaction is my middle name. But truly, something terrible has happened: last night, our oven died. It's a terrible time. It means I can't bake. Or even roast a chicken (which is less awful than it sounds, since we're eating at a friend's tonight). But still - sympathy please. Repairman is coming on Monday. Think happy thoughts. This is what is known as delicious. We get a bad rap for our food in this country. The rest of Europe thinks that we don't cook anything worth eating, and no-one ever knows what to suggest actually constitutes 'English food', apart from roast beef with Yorkshire pudding. I say now that I refer only to English food as opposed to Welsh because I am, in fact, English. One has to highlight these things, you see. I wouldn't want a run in with the Welsh Mafia (the Tafia?). I don't deny the lure of roast beef (although I can do without the Yorkshire pudding, thanks all the same). But the other day, Mr. Other P made scones (photographs provided as evidence of his ability - he has a very light hand you know, I could never make them as well as this), and it occurred to me that the scone deserves its place on the world stage. Ce que M. Other P a préparé à manger. Have you ever eaten a proper English scone before? They bear no relation to those triangular (??? ), chocolate studded things calling themselves scones you see in Starbucks in the US, which seem to promise moist succulence but deliver only dry-crumbed mealiness and nothing even resembling flavour. Well, save for the acrid tang of artificial vanilla. I am not slating American food. Far from it; I ate better when I was in the States than most other countries I have ever visited. 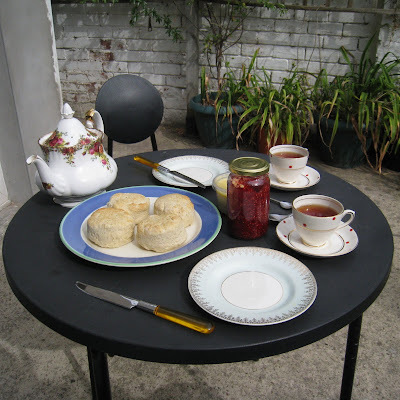 What I am saying is that a real scone, especially a homemade one, is a wonderful thing. Light, fluffy and delicately flavoured, they just plead with you to be split in half and spread with clotted or whipped cream and jam. Anyone who tries this recipe will never sneer at English food again. Mr. Other P has made scones four or five times so far this year. Always following this method, but sometimes adding sultanas or cheese (a savoury scone is a wonderful thing). He is convinced that it's quicker, and much cheaper, to make them than it is to go to the shop and buy some (we live about three minutes walk from a bakery, and four from a supermarket). I think he's right. Try this. Not because I told you to (good reason though that is), but because you want to make something really, truly English. 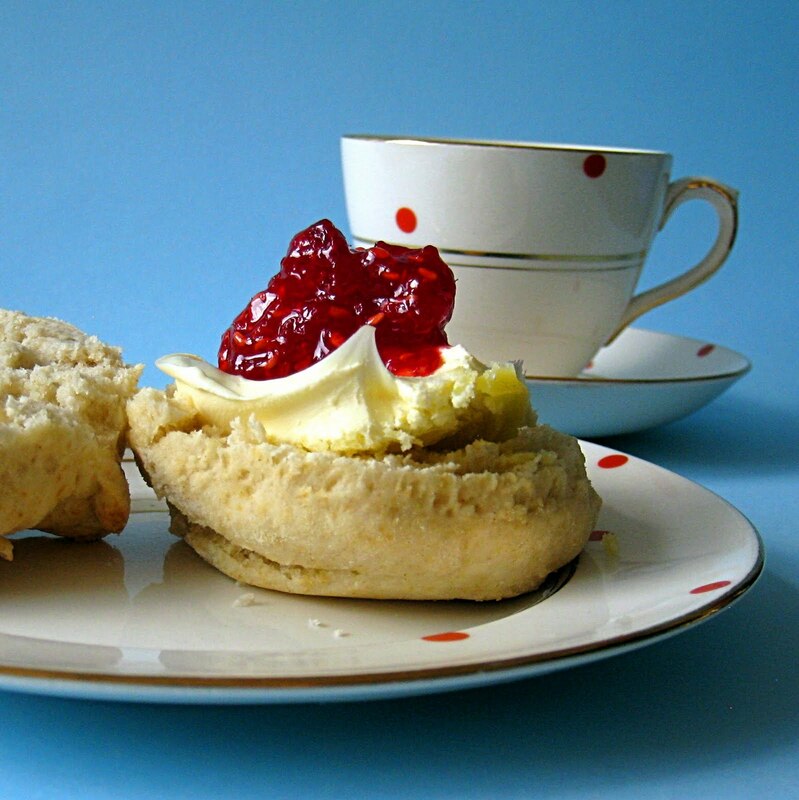 Get your teacups and teapot out, and it will be just like a Summer holiday in the Cotswolds. 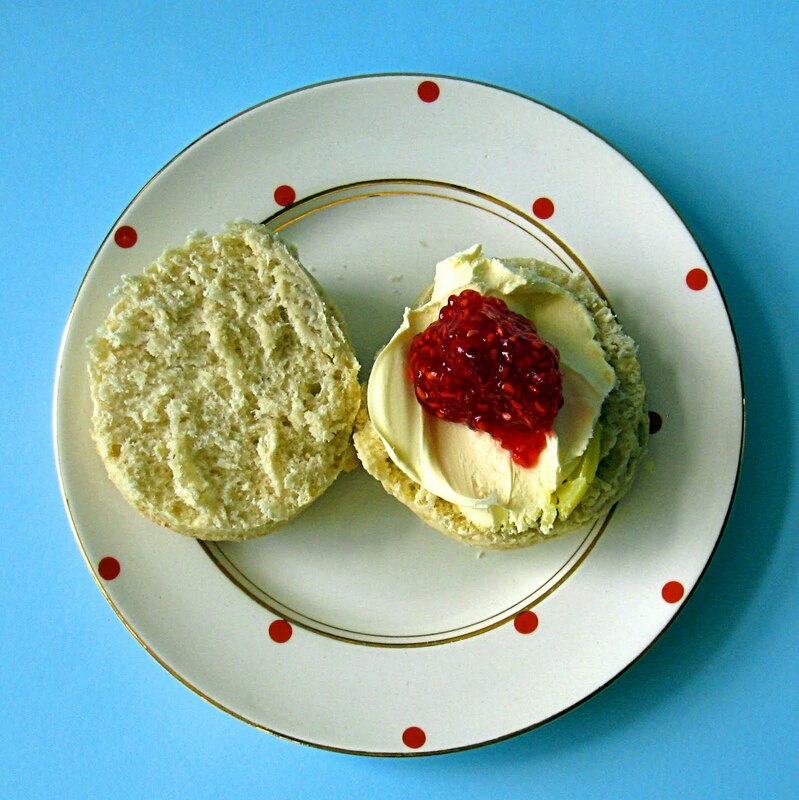 What else do you think of when you think of English food? Pies? Steamed puddings? Pre-heat the oven to 220°C, and lightly grease a baking sheet. Sift the dry ingredients into a large bowl. Add the butter and rub in using your fingertips, until you have a mixture that looks like damp sand. Add the milk, and stir with a fork until the mixture comes together. Turn out onto a lightly floured surface and knead briefly to form a dough. Roll out to a thickness of about 3cm and cut rounds using a medium sized round cutter. We don't have one of these, and use an upturned drinking glass. You can even improvise the rolling pin for this - a bottle of wine or ketchup will do. Place the rounds on the sheet, fairly close together. You should get 12, but it depends on how large your cutter is. Brush the tops with milk, and bake for 10 minutes or until well risen and golden. 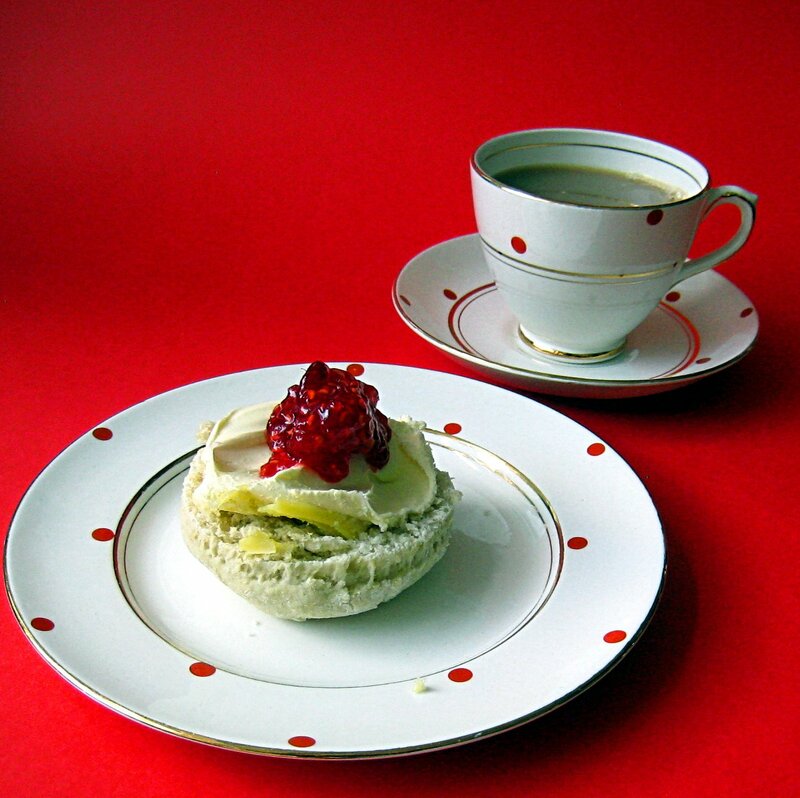 Serve warm with cream and jam. I hear your taunts. I can only apologise. I had a week off last week, and even though I thought there would be countless opportunities to cook and blog, there just weren't. I could, I suppose, have cooked something wonderful for the two friends that came to stay for a few days, and put the recipe up here. But we were too busy sunbathing at the beach during the day and talking and laughing at Nighty Night in the evenings for me to even think about slaving in the kitchen. I even went as far as to offer up Japanese curry rice from a packet as dinner. (Sorry Luce and Rish, and thank you for the pink Champagne. Next time, I'll cook properly). I say we were too busy to think about slaving in the kitchen, and that is true. It isn't true though that we didn't spend any time in there at all. Oh no. We made jam. Quickly, and unexpectedly, at around ten in the evening, having been out all day picking fruit in The Gower. That probably sounds like an act of complete madness, and I suppose that, actually, we did only decide to set out on a preserving marathon on a whim. Basically, when we realised that each one of us had picked a whole kilo of fruit: what were we going to do with it all? In typical 'oh, let's just wing it' fashion (for us lot at least), we picked up some jam sugar from the supermarket, picked out and washed some jars from the recycling bin, and dried them off in the oven. We then read (and largely ignored) the instructions on the sugar packet, and got busy. I don't think any of us thought it would actually work. Ideally, you'd have Lucy helping you. She's more thorough than I am. But it did! The two jams we cobbled together that night are sensational, so much better than anything you could ever buy. The texture is perfect, and because the fruit was so fresh, the flavours just sing. Can flavours sing? Well, these do. A fruity symphony of Summeriness. I urge you all to get jamming. If you use jam sugar, and follow the instructions on the paper bag, you don't even have to check for the setting point. It's easier than boiling an egg! One final word from me though: wear suitable shoes. 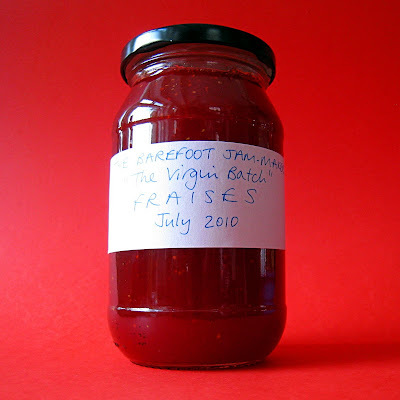 We'd been at the beach earlier in the day when we felt the preserving urge, and so were barefoot. We escaped without injury, but jam splashes burning your toes is a snafu I can do without having on my conscience. 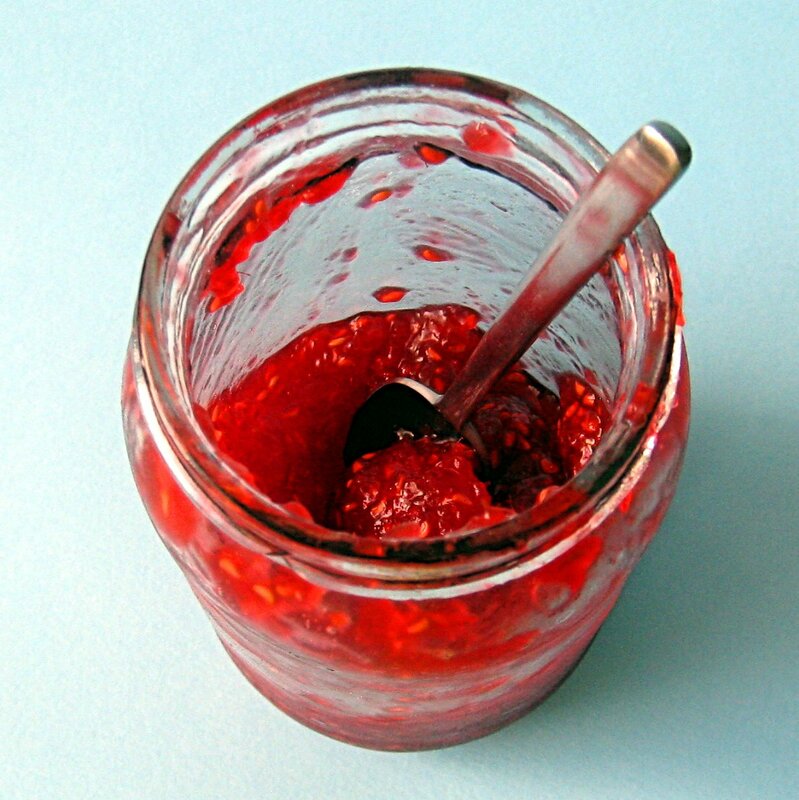 Go on: find your inner Grandma and make some jam. 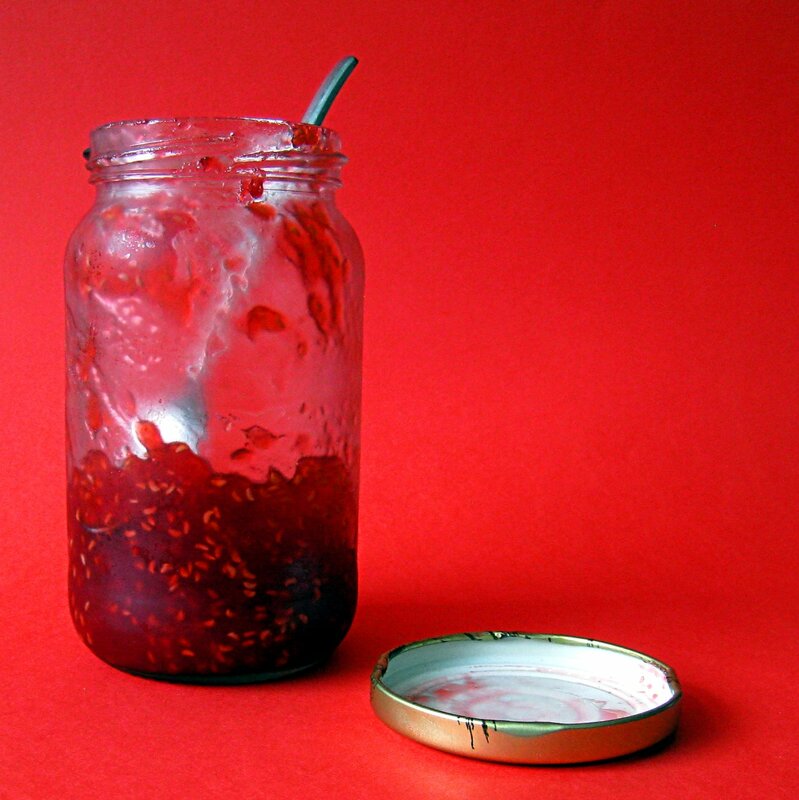 First, make sure you have clean jam jars. Wash them in hot soapy water, rinse, and put them on a baking sheet to dry in a low oven. 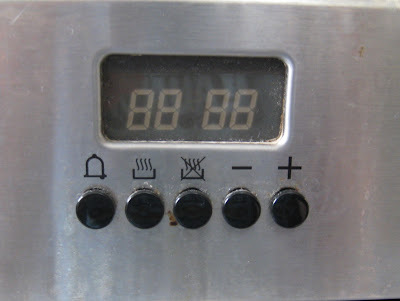 About 100°C is fine. Boil the lids for ten minutes and put them in the oven too. 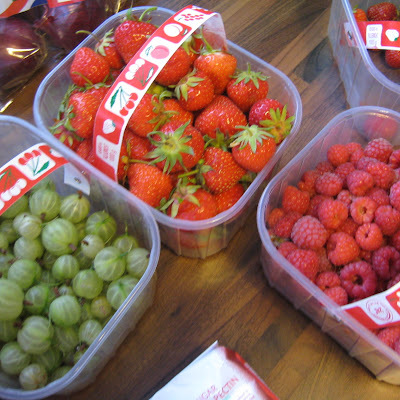 Pick over your berries, and remove all bad fruit and green leaves/ stalks etc. Weigh them, and prepare an equal amount of jam sugar. Put the sugar in a large pan, and either add the fruit whole, or mash it in. You can purée it in a blender if you like (we did for the strawberries). 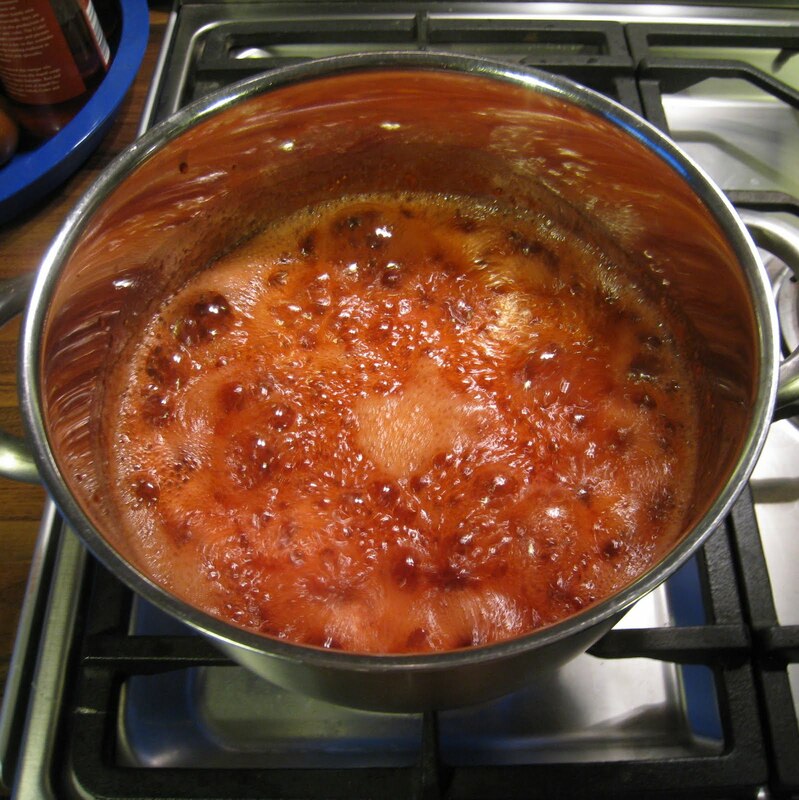 Over a low heat, stir with a wooden spoon until the sugar dissolves. 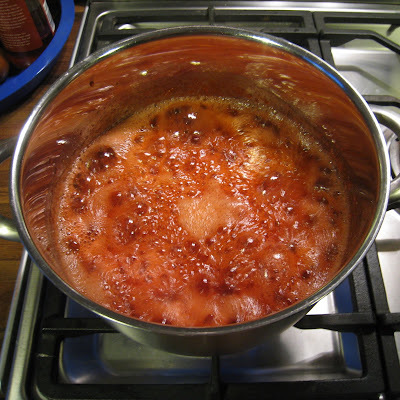 Then turn up the heat and, still stirring, bring to a full rolling boil (this is described on the packet as one that bubbles and causes the mixture to 'rise in the pan, and cannot be stirred down'). Allow to boil without stirring for 4 minutes. 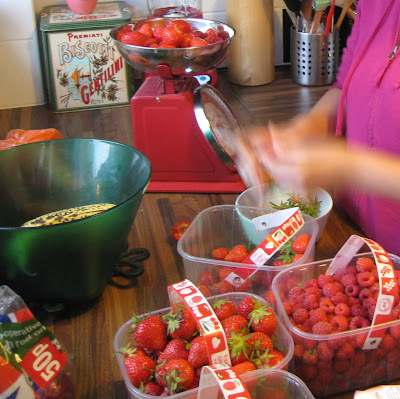 Remove from the heat, and pour into the jam jars, filling them almost to the very top. I use a jug for this. Put the lids on straight away, seal tightly, and allow to cool. I feel I should be doing more to plug Welsh food. Delicious Delicious Delicious was recently included in a feature on Cardiff-based bloggers for Wales Online, and I have been feeling a little naughty ever since then about the lack of any sort of Welsh focus on here whatsoever. Apart from those dragon cookies, of course. Anybody else getting excited by such a huge pile of flour and spices? I'm not about to start a monthly Welsh spot, or anything like that (it is hard enough keeping up with the pies anyway, quite frankly). I am an Englishman after all, and don't really know the first thing about Welsh food. I've never eaten laver bread (and probably never will), never made Welsh cakes (though I have bought them many times - one word: heaven) and I think cowl and stew are exactly the same thing. If you want to know about real, traditional Welsh cuisine, you would do better to ask someone else. But still I feel like I should be including it on the blog. So I am left with little choice but to post my recipe for bara brith, or 'speckled bread', which is the only truly Welsh food I ever really make at all, and even that is only sometimes. You will enjoy my tea cake. You WILL. I tried to find out some more than what I already knew about this fruited tea cake (which was not very much at all) when I was asked to make one for a friend's wedding cake. Up until that point, I'd held rather a negative view of bara brith, as my only experience of it was at poorly catered buffets, the sort where stale sandwiches are arranged on disposable foil trays and garnished with hard-boiled egg halves, and the cheap paper napkins are coloured navy blue. You always find slices of sometimes buttered, dry, crumbly fruit cake (the 'bara brith', apparently) next to old Welsh cakes at these kind of lunch tables. I'll be frank: I never cared for it. So I knew I had to find a good recipe for the wedding cake I was making. Because let's face it: dry buffet cake doesn't cut the mustard at a wedding. 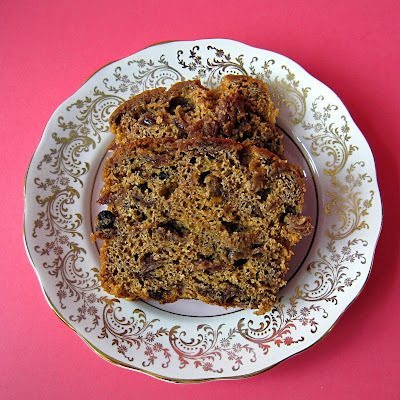 Like all 'traditional' foodstuffs, there are actually zillions of recipes for bara brith. Some contain eggs, some don't. Some are yeasted, and others use baking powder. Some are lightly fruited (the specks in the speckled bread are raisins), and some are heavy with tea-soused fruits. The only thing that recipes agree on is that the fruit should be soaked over night in tea. After that, anything goes. And of course, each of the recipes will declare itself 'the right way' to make a bara brith. I was drawn to the recipe below for several reasons. One was the method - I like the way the sugar is added in two parts. This creates crystals in the tea loaf, which add interest to the texture. Another was the lack of yeast. Yeast is terrifying. But most of all, I liked this recipe because it comes from the Williams family of Llandeilo, Carmarthenshire. I have no idea who they are, but I love that kind of provenance. Me being who I am though, I changed the recipe a little, and am giving you my version. If you want theirs, add less spice, and use weak tea, but for me, the tea flavour should be strong, and so should the spices. Give this a go. It's so easy, and it's fat-free to boot. Let me know what you think! Put half the sugar, the fruit and tea bags into a large bowl. Pour over the boiling water and leave over night. Next day, pre-heat oven to 180°C. Grease and line a 20cm round cake tin. Remove the tea bags and discard. Mix in the remaining sugar and then all the other ingredients. You should have a fairly wet and aromatic mixture. 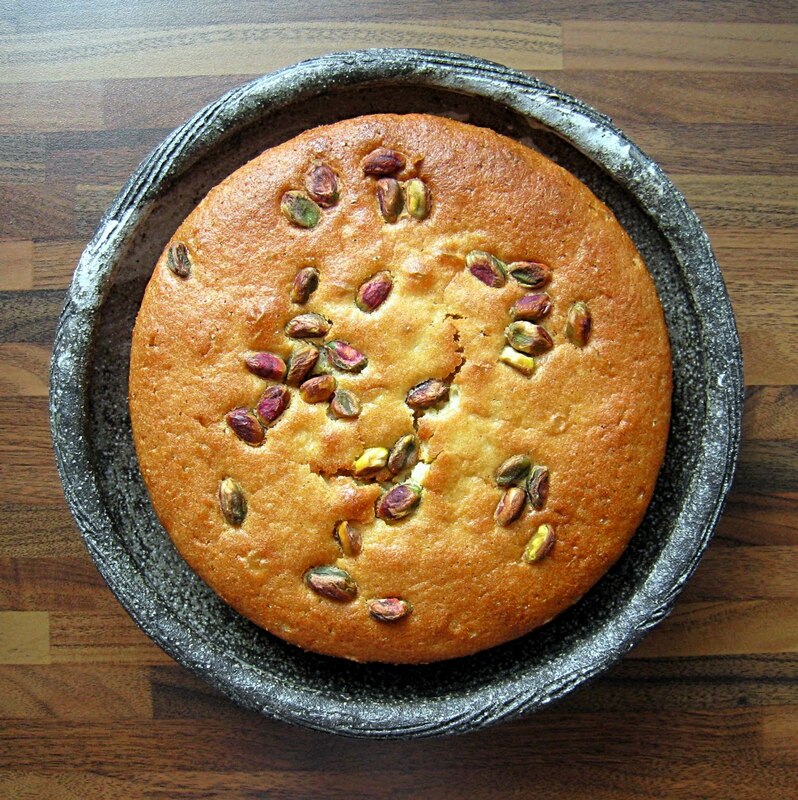 Pour the mixture into the tin and bake for about one and a half hours, or until a skewer inserted into the middle of the cake comes out clean and free of crumbs. Allow to cool, and store in an airtight tin for a day or so before eating. Some people slice thinly and spread with butter, but I prefer a big hunk of this, and always plain.